The naval Westland Wessex HC MK II was hovering over the Atlantic Ocean at 25 feet (8 metres) indicated on the radio altimeter as the “bambi bucket” hit the water surface in between the swells, attached by a cable to the belly of the British built helicopter. The hot breeze hits hard on the handling pilot’s face, as he observes through the opened right hand window the water-carrying scoop named after the famous Disney deer, receiving a beating from the 5 ft waves. “It feels as my feet are being pulled down”, the pilot thought. The winch operator, half hanging out of the helicopter’s right hand door, visually checks that the bucket is full, and informs the pilot it is time to climb. The Rolls Royce Gnome turboshaft engine whines as if complaining about the additional weight of the 800 litres of water on the scoop. The aircraft heads inland: time to put down a fire! In late January 2005, the South American nation of Uruguay experienced the worst forest fire in its history destroying over 5000 of acres of woodland on the coastal eastern region by the Rocha province. The authorities summoned the assistance of Air Force, Naval, Fire Brigade, Army, and civilian air assets to control the fires. Whilst the fire fighting was ongoing, a further focus erupted nearer the Brazilian border at the Santa Teresa national park – with its 18th century colonial fortress – and the area close to a small fishing village named Punta del Diablo where 8000 people were camping. Indigenous bush and property were destroyed but fortunately, no lives were lost. Starting on January 24th and lasting four long days, the fire fighting was carried out by the combined military and civilian effort. 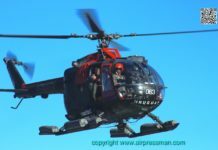 The Air Force (FAU – Fuerza Aérea Uruguaya) was first at the scene dispatching four rotary wing elements consisting of two Bell UH-1H, one Westland Wessex HC MK II fitted with bambi buckets, a Eurocopter AS 365N2 “Dauphin” (the three types attached to Escuadrón Aéreo No. 5/Air Squadron No. 5) from Base Aérea No. 1 (Air Base No. 1) at Carrasco airport near the capital Montevideo. Squadron 5 “Busy Bee” patch. A CASA C-212 “Aviocar” from Escuadrón Aéreo No. 3 provided transported equipment and logistical support whilst the Navy (Armada) with their Aviación Naval Uruguaya (Uruguayan Naval Aviation) utilised two Wessex HC MK II from Curbelo NAS near Punta del Este. FAU’s Squadron 3 “Aviocar” crews uniform patch. Civilian operators were placed on alert at 15:00 hours of the 24th of January, the orders coming directly from the country’s president. 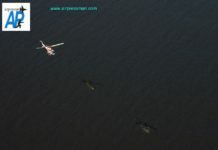 With great foresight and excellent timing, ANEPA (the Uruguayan national association of aero agricultural companies) jointly with the National Fire Department and the National Emergency Committee had carried out a forest fires combat course, for agricultural aircraft during August 2004. The course included training pilots, ground fire-fighters and Civil Aviation Authority personnel, in fire combat thus all participants achieving a common operating and communicating procedures. Civilian aircraft arrived at dawn on the 25th from all corners of the country, with a assorted fleet of crop spraying AG (Agricultural) types like GRUMMAN AG-CAT 164B, AIR TRACTOR AT-402 and CESSNA A188B AG-TRUCK. Many operators were involved on the rice harvest crop spraying operations and still positioned their aircraft and support ground teams immediately to the fire region. Seven further aircraft were placed on standby from operators located on a 50 nm (80 km) radius. A Cessna 182 was nominated as the Control aircraft and was the first civilian type to arrive to receive a briefing from the joint military, fire-fighter and Emergency Committee command. Now the arrangement was paying off, if to fight a natural foe: a raging blaze. The selected road was Ruta 9, a highway running on a west-to-east direction parallel to the sea, and extremely close to the fires becoming a landing zone/runway for all rotary and fixed wing aircraft involved. The western “runway” end accommodated the Command Post, the seven military helicopters and support equipment. Lt. 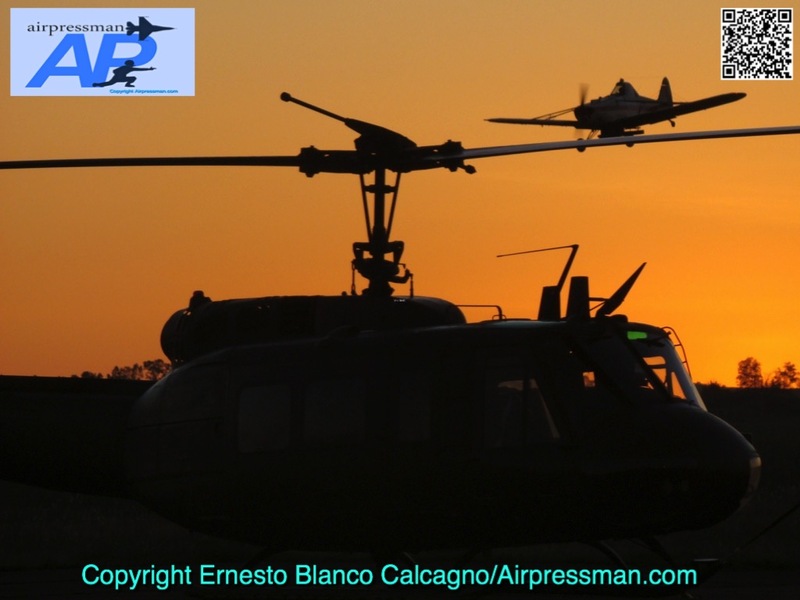 Colonel Carlos Amado, commander of the FAU’s helicopter Escuadrón 5 and one of Uruguay’s presidential helicopter pilots, was overseeing the operation of military (air force and navy’s) airplanes from rotary and fixed wing squadrons as well as civilian aircraft. This was a sensitive task, when dealing with another service branch and civilian pilots unaccustomed to military doctrine. Liaison with local and foreign ground fire-fighters (a Brazilian – portuguese speaking – detachment had arrived) as well as Uruguayan army and civilian personnel dealing with distribution of aircraft fuel, water lorries, heavy machinery and food supplies made the task a challenging one. A briefing with the local fire chief – following an observation flight on the fire department Schweitzer 300C helicopter – designated the area of operations for all aircraft and determined priorities for the mission: Save human lives, property and the local forest, some old and indigenous and the last remaining in the country. One RT frequency was designated for the military air units and another for the civilian crop sprayers. Before the frequency allocation, some hazards to the air operations became apparent. A naval Wessex at 300 ft AGL (100 mts) inbound to a water drop, narrowly missed a civilian crop sprayer. The Wessex’s pilots could see in disbelief as a civilian aircraft, came out from behind a hill passing a few feet below their heavily laden helicopter, on a clear air miss. A decision was quickly taken for the crop sprayers to fly circuits north of the LZ at 700 ft AGL whilst the rotary elements would do so below 500 ft.
Government authorities arrived on a FAU AS-365N2 “Dauphin” with the narrow two-lane Ruta 9 suddenly becoming too crowded. To facilitate ops the FAU choppers were positioned at an old and abandoned road running parallel to the present one, where naval Wessex would operate. The view of the operation zone with the constant take offs and landings of the helicopters was reminiscent of the Vietnam era, specially the image of the UH-1H splashing the dry tall grass in every direction. In the meantime, a FAU C-212 turboprop transport did a perfect touchdown – it was carrying out a shuttle service to Montevideo, to Brigada 1 at Carrasco AB – and backtracked via specially built wide turning areas on the road, bringing fuel, and relief personnel. FAU’s Cessna C206H kept circling above the fires, reporting directly to highway patrol to close roads and redirecting road traffic. Civilian private crop spraying aircraft with their eight pilots operated non-stop, three at a time reloading their water tanks, with engines kept running. On a coordinated manoeuvre the aircraft would discharge their loads every four minutes, their pilots risking their lives whilst flying at 90 ft (30 mts) over the fires, challenging high temperatures and turbulence to return immediately to their improvised runway to refuel and reload water. To expedite a water truck was place half way of the landing strip, thus aircraft would land, replenish their tanks and depart on the remaining stretch of runway. Ground crews achieved a level of synchronization that would put a Formula 1 team to shame, whilst completing these tasks. Evidence of trust and professionalism between the service and civilian personnel grew with time and was evident whilst a FAU C-212 on final approach was ordered by ATC to expedite its taxi after touchdown to the end of the runway, as he had six crop spraying aircraft behind on final. 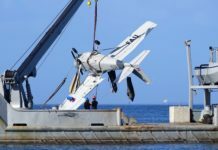 By the time the “Aviocar” completed its turn and the runway’s end, two of those AG planes recently on finals, were reloaded with water and airborne again! Certainly, “Ruta 9” was the busiest aerodrome in Uruguay at the time. The contribution of civilian ground teams and pilots – some with 8000 hours under their belts – was extremely valuable, especially as some aircraft– like the Air Tractor – could carry up to 1700 litres of water, more than double the load of the helicopters! The six AG planes were in turn taking off every four minutes dropping some 55.000 litres per hour. The raging fires where close to sea therefore all helicopters would load water in the ocean – for endurance and time on station purposes the bambi buckets where adjusted by ground crews to take 800 litres out of 1100 maximum – setting up a circular flying pattern from loading, dropping and returning to sea to collect more water. Each circuit lasting 3 to 5 minutes was titled calesita (merry- go- round) and in one hour a Wessex could drop their scoops 16 times -one naval crew achieving 37 drops during a one hour and forty minutes flight. To save time replenishing was sporadically carried out on adjacent water holes and lakes. Pilots found the mission exciting and were keen to aid people and save property and land. Some local homeowners were reluctant to abandon their properties and were enticed to do so by low flying helicopters. The “merry-go-round” pattern was somewhat monotonous and extremely tiring and crews were in awe of the amazing sight of burnt down trees and properties. The flying was filled with perils. Burning pine and highly flammable eucalyptus trees could and would fly directly upwards like a missile, as reported by a naval crew, exploding right in front of their Wessex! Flames would protrude upwards well above the treetops and incandescent pine kernels would fly up and explode like grenades! Nature was taking over too as mechanical, orographic and dynamic turbulence from the hot air rising had also to be dealt with. At times it was impossible to avoid tall smoke columns just before a drop, and a close eye was kept on the engines EGT (escape gas temperature) to avoid a out of limits increase, however the high winds blowing from the sea assisted the handling of the large heavy helicopters, providing more lift to the rotors. But the dangers were not solely for the aircrews, civilian, and military ground teams (one arriving from Santa Vitoria do Palmar in neighbouring Brazil) fought incessantly against the unpredictable behaviour of the fire unassisted by very hot, dry and windy conditions. They built fire break barriers and lighted “back burns” (fires to stop the fire) On the third day, during a brief break of operations (with a 40 knots crosswind) an increase on the intensity of the wind, resulted on the fire and smoke approaching the Command centre, the helicopters had to be repositioned to a nearby field, all flying IFR as they escaped through the dense smoulder. The battled against nature was finally won on the fourth day. A combined effort of civil and military brothers produced a positive end result. The high sense of achievement amongst all participants could be felt in the air, mixed with the smell of burnt trees. Many lessons were learnt, however now with more experience it was time to plan for the next hot summer season. Some pilots flew home with a few more grey hairs than before, back to their rice crop spraying jobs. FAU aircrews went back to base thinking when their next tour of duty to Eritrea with the UN would come whilst ANU naval crews thought or about when the next perilous SAR mission over the Atlantic would come…all in a day’s work! FAU 050 (Bell UH-1H-BF, s/n 12110, ex US Army 69-15822, in service since December 23, 1970) and FAU 053 (Bell UH-1H, ex UH-1D, s/n 5541, ex US Army 66-1058, in service since July 21, 1998), FAU 091 (Aeroespatiale DAUPHIN AS 365N2, s/n 6532 in service since March 27, 1998), FAU 076 (Westland WESSEX HC MK II, s/n WA122, ex RAF XR497 “F”. In service since August 8, 2002). FAU 716 (Cessna U206H, s/n 20608009, in service since February 22, 1998) attached to Escuadron de Enlace (Liaison Squadron). Based at Àngel S. Adami airport, Melilla, north of Montevideo. AIR TRACTOR AT-402 (CX-BUD) Lionel Rossi Aviation, Nueva Hesperides, Salto County. Cessna 182 (Control Aircraft, CX-ARJ) Progreso Aeroservicios, Progreso, Canelones County.